Did you ever wake up to one of those days where everything is a problem? You have 10 things to do, but only 30 minutes until your bus leaves. Is there enough time? You have 3 shirts and 2 pairs of pants. Can you make 1 good outfit? Then you start to wonder: Why does everything have to be such a problem? Why do 2 apples always have to be added to 5 oranges? Why do 4 kids always have to divide 12 marbles? Why can't you just keep 10 cookies without someone taking 3 away? Why? 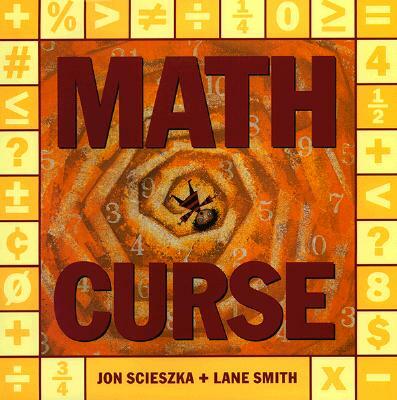 Because you're the victim of a Math Curse. That's why. But don't despair. This is one girl's story of how that curse can be broken. Multiple award-winning author Jon Scieszka grew up in Flint, Michigan, the second oldest and the nicest of six boys. Jon went to school at Culver Military Academy in Indiana where he was a Lieutenant; Albion College in Michigan where he studied to be a doctor; and Columbia University in New York, where he received an M.F.A. in fiction. He taught elementary school in New York for ten years in a variety of positions. He is the author of many books for children including the New York Times Best Illustrated Book The Stinky Cheese Man and Other Fairly Stupid Tales (illustrated by Lane Smith), the Caldecott Honor book The True Story of the Three Little Pigs (illustrated by Lane Smith), and Math Curse (illustrated by Lane Smith). In addition to his work as an author, Jon also runs a web-based literacy program called “Guys Read” that is designed to encourage boys, particularly reluctant readers, to get involved with books. In 2008, Jon was named the country’s first National Ambassador for Young People’s Literature, a joint effort of the Library of Congress and the Children’s Book Council. During his two-year role as Ambassador, he acted as a spokesperson for children’s literature, speaking to groups of parents, teachers, and children to encourage the importance of reading. You can visit Jon online at www.jsworldwide.com.